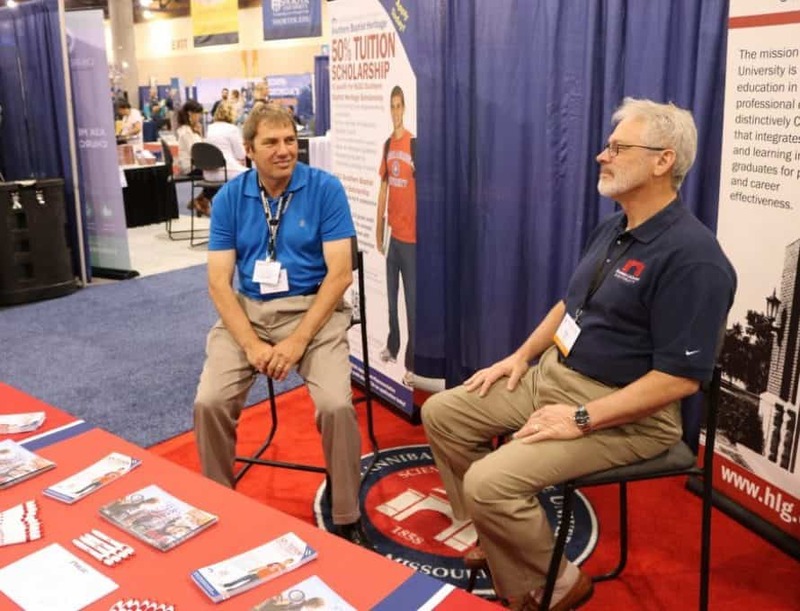 PHOENIX – The exhibit hall of the Southern Baptist Convention was buzzing with activity as SBC related colleges, seminaries, entities and ancillary organizations vied for the attention of the convention messengers. The air conditioning was cranked down sufficiently to cool the conventioneers who braved 100 plus degree heat getting into the downtown convention hall. At the Hannibal-LaGrange University booth some Missourians visited with university staffers. Ray Carty offered HLGU “swag” and spoke to them about the university in northeast Missouri. The Pathway caught up with a few of these Missourians milling around and asked for their stories and reactions to the SBC. Lisa Crow said they had enjoyed taking in the meals offered by SBC entities, NAMB, IMB and LifeWay. “Good food and gifts offered,” she said. He said he was disappointed there was not a greater focus on SBC disaster relief in the exhibit hall though. But he said he would encourage every pastor to attend an SBC meeting if possible. Green was at the SBC with his wife and five small children. They want their children to grow up with a passion for missions and to see it up close, meet missionaries, hear the preachers and leaders of the SBC. He said he graduated from an independent, fundamental university, Tennessee Temple University. Many of his fellow graduates, who are in missions work, now have to raise their funds in order to stay on the mission field. “Not so with SBC missionaries,” Green said. He appreciates that about the SBC. Marble Hill is a town of about 1,500 people, Green said. “Hunters, farmers…that’s who we minister to mostly.” He has served there for about two and a half years. A church planter, who hails from Missouri, but is currently serving as a NAMB supported lead pastor of a new church in Tucson, Jeff Vanderford, said he also appreciates the Cooperative Program and all it supports. He is from the Kansas City area and moved to Tucson three years ago to plant Authentic Life Church. Previously he served at South Platte Baptist in Parkville and at Antioch Bible Baptist in Kansas City. He graduated from Midwestern Seminary. He also served as a collegiate ministry specialist with the Clay-Platte Baptist Association. But he has found a niche in a neighborhood of Tuscon, located about a hundred miles south of Phoenix. He and his wife, Jessica, worked with the NAMB Send City program and toured Tuscon. They found a home in “A Town” a community dominated by a mountain with a gigantic “A” outlined in rocks to highlight the University of Arizona campus. The home had plenty of parking and room to start a Bible study in and they were able to move in and start the church. Many people think it is ok to have a religious faith, but it is ok for you but not for me,” Vanderford said. The church launched about two years ago. They are looking for more partners to assist with projects and financial support. Vanderford encouraged interested persons to check their website at www.authenticlifeaz.com.